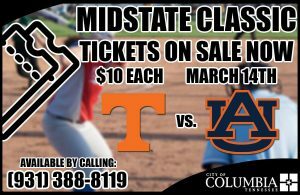 The City of Columbia is becoming known for its sports and the Midstate Classic is a big part of it! Each year in beautiful Ridley Park, the Midstate Classic has become the place to be to watch great softball. This year the University of Tennessee Volunteers are squaring off against the Auburn University Tigers in a softball doubleheader that you will not want to miss! Columbia State will go up against Trevecca Nazarene University at 3 pm followed by University of Tennessee against Auburn University at 6 pm. After the games, a player autograph session will be held and spectators are invited to attend. Additional parking is available at Columbia State Community College at 1665 Hampshire Pike, Columbia, TN. 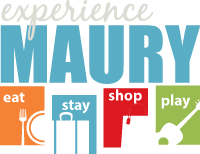 A round trip shuttle with the Muletown Trolley are available for $2.00 and will start at 1 pm that day. For more information please call the City of Columbia Parks and Recreation at 931-388-8119.